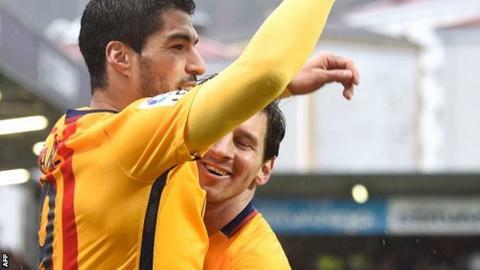 Barcelona went 11 points clear at the top of La Liga as Lionel Messi scored twice in a comfortable win at Eibar. Luis Suarez was also on target to take the combined tally for him, Messi and Neymar to 100 goals this season in all competitions. Messi scored his 20th and 21st league goals of the season as Barcelona took their unbeaten run to 36 games. Munir El Haddadi had opened the scoring early and Suarez got on the scoresheet in the closing stages. Barcelona took just eight minutes to take the lead as Messi's fine, aerial pass freed Suarez and his cross was tapped home by El Haddadi, who was deputising for the suspended Neymar. Eibar missed the chance to equalise when an unmarked Gonzalo Escalante volleyed wide from six yards out. The hosts were punished three minutes before half-time when Messi produced an excellent, low finish to double Barcelona's lead. They were awarded a penalty 15 minutes from full-time when Ivan Ramis was penalised for handling a Messi cross, and the Argentine sent the spot kick down the middle to make it 3-0. Suarez added the fourth when he beat defender Ander Capa and scored with a low shot with six minutes to play. Barcelona also managed their first clean sheet since early February as they closed out victory comfortably. Second-placed Atletico Madrid are eight points back after beating Valencia 3-1 in the evening game. Match ends, Eibar 0, Barcelona 4. Second Half ends, Eibar 0, Barcelona 4. Offside, Eibar. Saúl Berjón tries a through ball, but Izet Hajrovic is caught offside. Josip Radosevic (Eibar) wins a free kick on the right wing. Attempt saved. Sergi Roberto (Barcelona) right footed shot from outside the box is saved in the bottom left corner. Assisted by Lionel Messi. Substitution, Eibar. Takashi Inui replaces Sergi Enrich. Corner, Eibar. Conceded by Dani Alves. Attempt blocked. Adrián (Eibar) right footed shot from outside the box is blocked. Assisted by Ander Capa. Substitution, Eibar. Izet Hajrovic replaces Gonzalo Escalante. Goal! Eibar 0, Barcelona 4. Luis Suárez (Barcelona) right footed shot from the right side of the box to the bottom right corner. Assisted by Sergi Roberto. Attempt missed. Aleksandar Pantic (Eibar) header from the centre of the box is close, but misses to the left. Assisted by Iván Ramis with a cross following a set piece situation. Attempt saved. Luis Suárez (Barcelona) header from the centre of the box is saved in the centre of the goal. Assisted by Lionel Messi with a cross. Dani García (Eibar) is shown the yellow card. Foul by Aleksandar Pantic (Eibar). Substitution, Barcelona. Marc Bartra replaces Gerard Piqué. Substitution, Barcelona. Sergi Roberto replaces Arda Turan. Offside, Eibar. Josip Radosevic tries a through ball, but Sergi Enrich is caught offside. Attempt blocked. Adrián (Eibar) left footed shot from the left side of the box is blocked. Assisted by Sergi Enrich. Goal! Eibar 0, Barcelona 3. Lionel Messi (Barcelona) converts the penalty with a left footed shot to the centre of the goal. Penalty conceded by Iván Ramis (Eibar) with a hand ball in the penalty area. Arda Turan (Barcelona) wins a free kick in the defensive half. Iván Ramis (Eibar) is shown the yellow card for a bad foul. Substitution, Eibar. Saúl Berjón replaces Borja Bastón.